Email Test List allows you to create a list that will be used for internal testing. Public List should be created only when you want to make the list available on Email Preference Center. Public List allows your prospects to add or remove their name from the list by using Email Preference Center page. CRM Visible list allows users to add to or remove prospects from your CRM. This option is available only if you have a verified CRM connector between Pardot and Salesforce. GurukulOnCloud has hundreds of prospects in their Pardot database. They are planning to send marketing emails to prospects whose Job Title is Director. GurukulOnCloud wants to accomplish two things simultaneously – (i) create a list in Pardot; (ii) and, make sure that prospects can be automatically, added or removed, from the List based on their Job Title. To solve the preceding business requirement we will use Dynamic List. By using Dynamic List prospects can be automatically added or removed, as prospect data changes. If the list will be used for internal testing, then select Email Test List checkbox. However, we are not going to select this option because a test list cannot be used as a Dynamic List. As ours is a Dynamic List, it is not possible to make the List available for Salesforce CRM by selecting CRM Visible checkbox. CRM Visible List allows prospects to be added to, or removed from, your CRM. As a result, once you select Dynamic List checkbox then, CRM Visible checkbox will be not visible on the setting page. When finished, click on the Set Rule button to set criteria for the Dynamic List. To remove rule criteria, click on the trash icon. Optionally, you can click on the Preview button. Then Preview Matches to see which prospects match the rules. You can share the preview with other Pardot users by sending them the link. 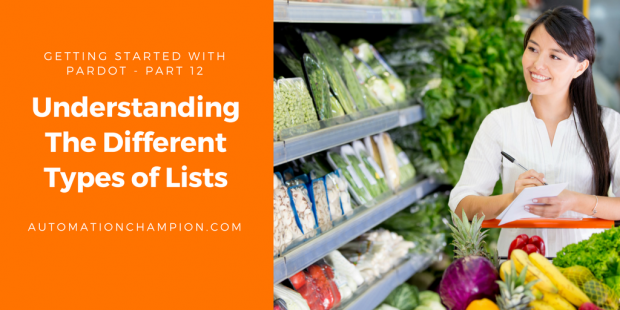 Navigate to Marketing | Segmentation | Lists. Then click on the Delete option, as shown in the preceding screenshot. –> Standard Edition accounts can have up to 50 active Dynamic Lists; Pro and Ultimate Edition accounts have unlimited Dynamic Lists. –> It is possible to make Dynamic Lists as public and display them on your Email Preference Center where prospects can opt-out of the List if they choose. –> When using the account or opportunity rule criteria, the Dynamic List will match only those prospects that have an associated opportunity or account. Prospects without an opportunity or account will not match the list. In my next blog, I will take a deeper dive by showing you create and manage Static list in Pardot.